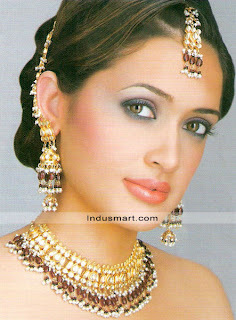 Kundan Jewellery set, set consists of a necklace , a pair of large earrings, and teeka and a ring. Settings, in kundan and semi precious stones. An contemporary design, set consists of a necklace, a pair of large earrings,and a ring. settings in semi precious pearl beads, kundans, and crystals. 22K Gold and rhodium plated. Settings in kundan, crystals and semi precious pearl beads. Set consists of a necklace, a pair of earrings, and a ring. 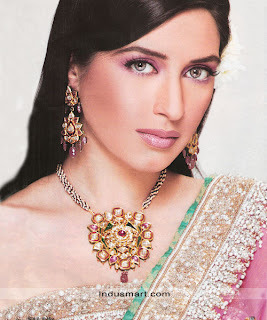 setting in kundan and colored semi precious stones. Set consists of a necklace, a pair of large earrings, and a ring. 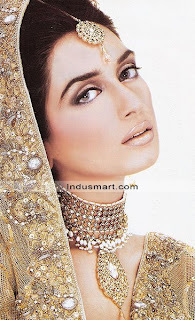 setting in kundan, colored semi precious stones. setting in zircons, kundans and colored semi precious stones. Setting in kundan, crystals and semi precious stones. setting in kundans, and colored semi precious stones. Set consists of a Necklace, a pair of earrings, and a necklace. A very Fine piece in silver and gold polish setting in cubic zircons an semi precious stones. Set consists of a Necklace, a Pair of large earrings, and a ring. 22k Gold and platinum plated. cubic zircons, crystals, and sem precious stones. An Elegant and royal design, setting in colored kundans and semi precious stones. Set consists of a Necklace, a pair of large earrings, and a ring. colored kundans and semi precious stones setting. Set consists of a Necklace, a pair of earrings, and a bracelet. A Intricate and classy piece, setting in cubic zircons, kundan and semi precious stones. Set consists of a Necklace, a pair of long earrings, and a ring. 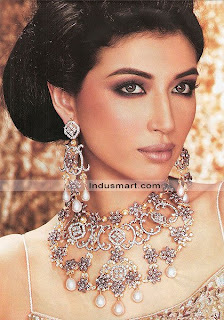 Setting in zircons, kundan and semi precious stones. An artistic classic piece, set consists of a pair of long earrings, a necklace, and a ring. Made with 925 sterling silver, kundan and zircons settings. 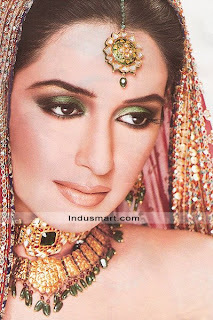 zircons, kundan and colored semi precious stones setting. Set consists of a Necklace, a pair of earrings, teeka, and a ring. Setting in kundans, semi precious stones. An Intricate and classy design, setting in zircons, semi precious stones, colored crystals and kundans. Set consists of A NeckLac, a pair of Long Earrings, and a ring. zircons, colored crystals, kundans and other semi prescious stones used. An elegant and traditional design, setting in semi precious colored stones, pearl shaped beads and colored kundans. Set consists of a Necklace, a pair of earrings, and a ring. Colored stones, pearl shaped beads, and colored kundans. A traditional design settings, in colored garnetts, kundans, 925 silver etc. Set consists of a NeckLace, a pair of Long earrings, teeka and a ring. Setting in kundan, garnets, and other semi precious stones. A very intricate and traditional design,set contains a Necklace , a pair of long earrings, and a ring. Various kinds of semi precious stones used. 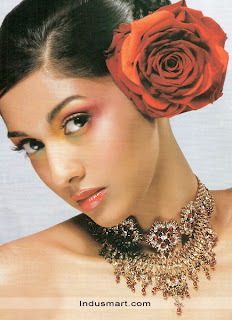 A traditional & intricate design, made in delicate floral pattern, setting in kundan, zircons and semi precious stones. Set consists of a Necklace, pair of long earrings, teeka, and a ring. Kundan, zircons and semi precious stones setting. precious stones used. Set consists of a Necklace, a pair of earrings, and a ring. Zircons, kundans, and semi precious stones. Diamond like setting, Set contain a necklace, a pair of earrings, and a ring. Settings in zircons and crystals. Zircons, and semi precious stones used. 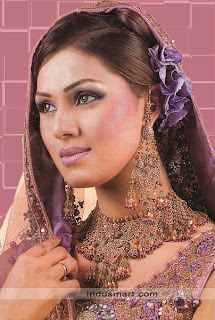 This set consists of a necklace, a guluband, and a pair of earrings, setting made with kundans &semi precious stones. Kundans, and semi precious stones. Elegant Jewelery settings in kundans, and colored stones, consists of a Necklace, pair of earrings, and a ring. Setting in kundans and semiprecious stones. An Amazing Diamond like zircon set, come with a Neclace, a pair of large earrings, and a ring. A very Rich and traditional design, set consists of A necklace, a pair of large earrings, teeka and a ring. 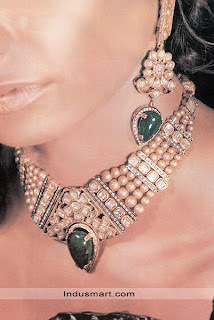 A traditional kundan design, set consists of A necklace, a Pair of earrings, a teeka and a ring. Set consists of a Necklace, a pair of earrings, and a teeka. An Amazing zircon set consists of a Necklace, a pair of earrings, and a ring, made in gold and silver shades. 22K Gold & Rhodium Plated. Zircons, and semi precious stones. Very Rich in silver set consists of a pair of earrings, necklace, teeka and a ring. Kundans, precious and semi precious stones used. 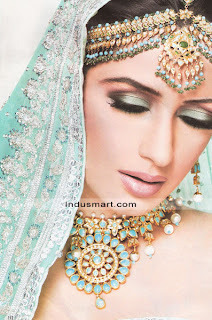 Amazing turquoise colored stones set consists of anecklace, pair of earrings, teeka and a ring. Set Consists of a necklace, pair of earrings, and a ring. Kundans, crystals and semi precious stones. Traditional design jewellery set consists of one Necklace, one pair of large earrings, teeka, and a ring. 92.5% Pure silver (925 sterling silver). Kundans, precious and semi precious stones. An Elegant modern design, made with 92.5% silver (925 sterling silver) 22 K Gold Plated, stones used are zircons, semiprecious pearls and stone, crystals. Set consists of one pair of earrings, necklace, and a ring. Zircons, semi precious stones, and semi precious pearls. Set contains a Necklace, one pair of Large earrings, a bangle and a Ring. Zircons, crystals, and semi precious stones used. 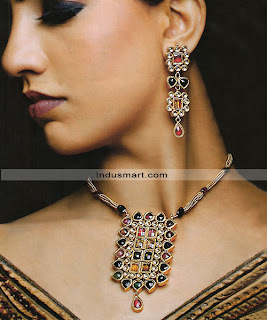 A very Traditional and Rich design, set consists of a Necklace, a Pair of large earrings. Set contains one pair of necklace, one pair of Large earrings. Semi precious pearl beads of various size are used, with zircon, and crystals. Modern yet Elegant design, crafted with 92.5% pure silver (925 Sterling silver) using zircons and crystals of various shapes and semi precious stones, polished in 22k Gold and Rhodium. 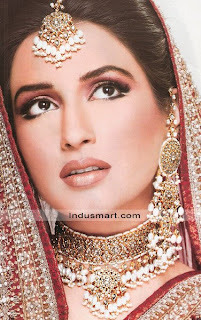 Zircons, kundan and semiprecious stones. A very intricate design, worked in very fine settings. Set consists of Neclace , pair of Long earrings, and a ring. Kundans of various shapes, precious and semi precious stones used. Amazing high fashion set made with 925 sterling silver, 22k Gold and Rhodium Plated. Main set is plated in Rhodium, and 22k gold plating is used around colored crystals. Other materials used are cubic zircons, colored crystals, kundan, and semi precious stones. Cubic zircons, kundans and semi precious stones used. 22K Gold and Rhodium Plating. Set consists of Necklace, pair of earrings, and a ring.